Cyprus is the third largest island in the Mediterranean Sea, located approximately 65km from the southern coast of Turkey.Neighbouring countries include Syria (approximately 97km away), Egypt (approx 370km), and the Lebanon (108km away).The island of Cyprus was legally divided in 1974 and the Turkish Cypriots live in the north, whilst the Greek Cypriots live in the southern part of the island. Recent political discussions have relaxed border control issues, and you can now cross from south Cyprus into North Cyprus through several border checkpoints near Nicosia.At present, you can drive a south Cyprus hire car into North Cyprus, but you cannot drive your North Cyprus hire car south of the border. North Cyprus comprises approximately one third of the island of Cyprus and covers a total of 3,515 sq km. North Cyprus is 242 km wide and 64 km deep and with cheap car hire in North Cyprus from Pacific car hire, you can explore the entire northern part of Cyprus at your leisure and for less cash too. The island's present shape is due to the effects of the pressure of the sea on its sides, and throughout the ages capes and gulfs have been formed. 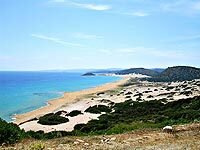 There are two significant capes and two gulfs in North Cyprus.Zafer Cape is located at the end of the Karpaz peninsula and Korucam Cape is located on the west. You can easily drive from cape to cape if you hire a car in North Cyprus from us. The Kyrenia Mountains, also known as the Five Finger Mountains are the most prominent feature to be found in North Cyprus.These mountains run parallel to the coastline and are made up of a narrow range that is approximately 130km in length, and cover a total of 260 sq km.Up above the village of Lapta is Mount Selvili, the highest point of these mountains, located over 1,023 meters above sea level.Lapta is a fascinating place to visit, with part of the village right on the coast and the rest nestling amongst lemon and olives groves. The best way to explore the North Cyprus mountains, including ruined Crusader castles and abandoned monasteries hidden in pine forest, is with a 4x4 vehicle, such as a Suzuki jeep, for hire from Pacific Rent A Car. In the centre of North Cyprus you will find the Mesaoria plain, known as the breadbasket of Cyprus, used to grow crops such as oats, wheat, and barley. The Mesaoria plain can be found between Kyrenia Mountains and the Troodos Mountains. All along the coastline of North Cyprus you will find beautiful bays and beaches to explore and enjoy.To the north and east of our country you will find crystal clear blue waters that are warm and excellent for swimming all year round.The largest bays to be found are in Guzelyurt and Famagusta, with many deserted beaches on the southern side of the Karpaz Peninsula, now an easy drive from Kyrenia for a hire car thanks to the new road. Explore the geography of North Cyprus with car hire from Pacific Rent A Car, the North Cyprus car rental experts.